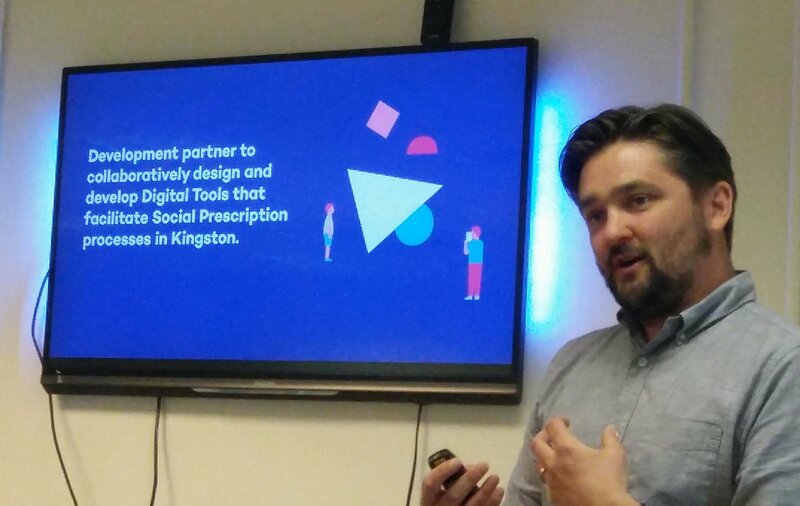 Last month we shared the exciting news that we were appointed digital partner for Kingston Council's new social prescribing service, Connect Well Kingston. Following our appointment we were invited to a stakeholder engagement session that was organised by Kingston Voluntary Action (KVA) and held within The Community Hub at John Lewis, Kingston (one of the more interesting venues for holding an event such as this!). The primary purpose of the session; for the Connect Well Kingston team to share an update on the wider programme work streams that have been happening since the new year and to further develop understanding and ideas through a co-design activity. This also involved an update on the digital work stream which provided an ideal opportunity for us (Ayup and mHabitat) to introduce ourselves to the wider stakeholder group, to explain our remit and our intended process of co-designing a series of digital tools that will ultimately facilitate the social prescribing service, which is due to begin in September this year. One key asset to The Connect Well Kingston project is Siân Brand, programme manager for Connect Well Essex - a similar and successful social prescribing service based in Essex. Siân has been working with stakeholders in Essex over the last year, following a co-design approach to develop the Connect Well Essex digital platform and is now advising Kingston Council on how they might roll out a similar service. Siân, along with Kate White (Superhighways at Kingston Voluntary Action) and the council's digital team; Ben Cheetam (Service Design Lead), Tim Taylor (Business Analyst); and the council's digital product owners Rob Scott-Clark (Homelessness Trailblazer Project Manager), Chris Jones (Commissioning Lead - Preventive and Community Services) are spearheading the transformational project from within the Council. During our introduction to the group of stakeholders, we shared and explained the people-centred approach that we've deployed successfully on many of our other Tech for Good projects. 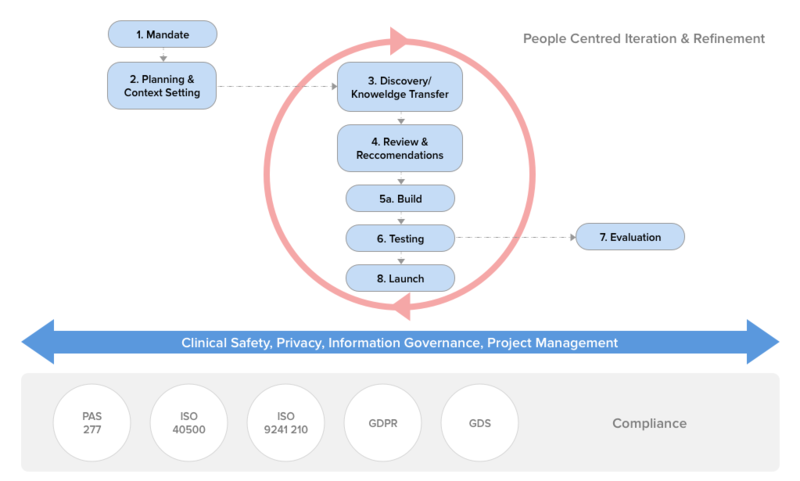 The approach very much follows the agile principles of iteration and refinement but also includes a layer of clinical safety, privacy, information governance and accessibility compliance. Led by Technical Lead at mHabitat and co-design expert, Steve Lloyd-Smart - the second half of the stakeholder engagement workshop focused on further developing our collective understanding of a wide range of individual user stories and journeys, as well as facilitating group ideation for solutions to core functionality. A large number of people and organisations from across the borough were in attendance, including Kingston Libraries, Jobcentre Plus, Kingston CCG, Mind in Kingston, YMCA, Superhighways, Boom Credit Union and many others. With such a large number of people in attendance, facilitators encouraged participants to write down ALL ideas, thoughts and comments - ensuring all views are captured, reviewed and considered. Armed with a stack of post-it notes and coloured stickers (for voting), collectively the groups generated almost 300 post-it notes full of insightful and useful feedback, ideas and comments. These were transcribed and manually categorised and processed by the digital team before being synthesised. There's a large number and large variety of potential users of the service, each having a wide range of needs and requirements as well as familiar existing processes. We need to ensure the digital tools compliment and support rather than replace. This poses interesting challenges in terms of developing the platform and creating a process that is simple to use for all but provides enough data to demonstrate some level of efficacy that will lead to the provision of ongoing resources to support it. It was very heartening to see the number of stakeholders who are supporting the development of the Social Prescribing service in Kingston. An emerging theme was around the importance of supporting an Asset Based Community Development (ABCD) project such as this with ongoing infrastructure, resource and support - and that follow-on support being just as important to the success of the project as the digital product itself. Furnished with lots of useful feedback, comments and ideas, our priority over the next few weeks is to further translate these into prioritised feature specifications (on Trello) and prepare to enter into our first alpha sprint, where we'll be focusing on producing wireframes and prototypes for key features that can then be tested with stakeholders.